Per the International Confederation of Revolver Enthusiasts (ICORE) website, the organization "serves the international community to promote action shooting competition with revolvers." As a wheel gun enthusiast, ICORE seems like the perfect league for me to see how I stack up against other revolvers shooters. There are several divisions allowing all configuration of wheel guns of to compete on a level playing field. Unfortunately there are no clubs in my immediate area, with the closest being about three and a half hours away. By shear happenstance, I stumbled upon a match less than two hours away. 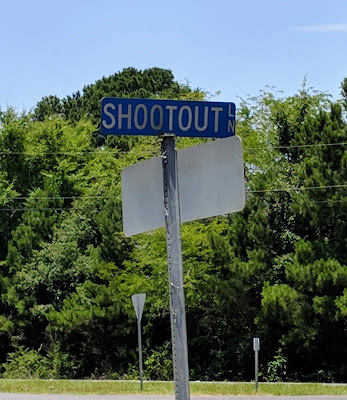 The Southern Regional Revolver Championship was scheduled for June 23rd, 2018 in Princeton, Louisiana on Shootout Lane. For those unfamiliar, that is home base for Jerry Miculek who is arguably the best revolver shooter on the planet. I decided to register in Open Division because of my fondness for red dot sights on revolvers. I even have family in the area that I don't get to visit very often, so I didn't have to worry about a hotel. (Thanks Phillip!) I was excited to finally shoot an ICORE match! I was placed in Squad C with nine other shooters, several were also running S&W 929s in the Open Division. 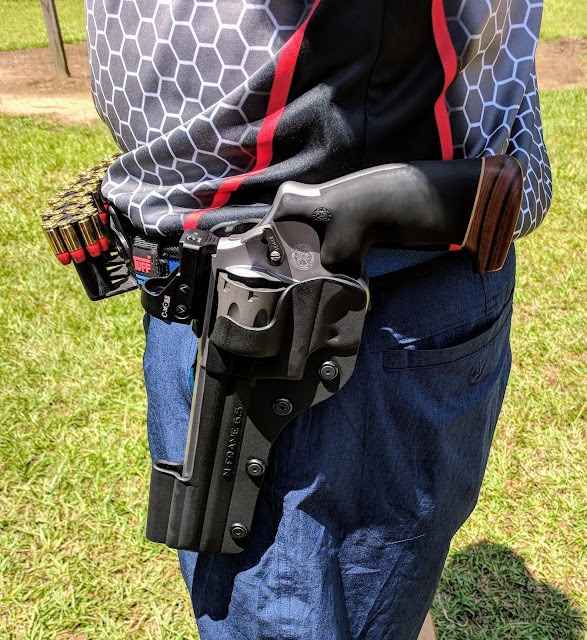 I am often shooting by myself at local matches as there are very few revolvers shooters, so shooting against other wheel gunners is a nice change. This squad was full of seasoned shooters who were happy to discuss similar participation issues, gear choices, and stage strategy. Here are my videos of the eight stages at the 2018 Southern Regional Revolver Championship! Summer Run was the highest round count of the match with 34 scored rounds. As the video show, I shot T1 - T6 very slowly. I notice I drop my revolver between each position, while other shooters kept their guns up and in their line of sight. I need to work on doing the same. The reloads between each position were fine, but I can definitely use a lot more practice here as well. Run and gun stages are fun, but I'm glad there were only two high round count stages. I finished 6th in my division in 23rd place overall! In Your Face was a classifier stage and I believe most of the squad had shot it before. I decided to shoot the middle array on the move, and while it felt a lot faster in my head it may have been better to just stop in the middle section. Shooters had the option of moving from Box A to Box B (left to right) or from Box B to Box A (right to left). To my knowledge I was the only one who moved right to left in my squad, because I'm a lefty, but I could be wrong. I finished 5th in my division in 25th place overall! Summer Steel was an all steel plate stage. Although there are almost double the amount of plates, it is still similar to something you might find in Steel Challenge. The stage required three strings of fire. The sum of the three strings was your total time. Again, shooters had the option of moving from Box A to Box B (left to right) or from Box B to Box A (right to left). This stage was really fun and I didn't need too many make up shots. I guess attending a handful of steel matches has payed off. I finished 5th in my division in 24th place overall! Summer Swinging was my second best finish! Everyone discovered there was a spot a few steps from the start position where both steel poppers could be hit and activate the swingers. The swingers had me worried until I reached the ports. By the time I engaged them, both were moving slowly enough that tracking the dot on paper wasn't too difficult. I finished 4th in my division in 22nd place overall! Summer Ports was the final stage of the day for Squad C. Each port framed a pair of paper targets with a plate rack centered on the range. Shooters were to engage both paper targets and one steel plate through each port. I felt this was my best stage of the day except for the bobble on the fourth port. I put the dot on the paper, then to the corresponding plate, and then quickly back to the paper. I guess I couldn't decide what to shoot first. I felt like I would earn a penalty for engaging out of order which is why I went back to the paper. Despite this hiccup, I finished 5th in my division in 18th place overall! Summer Clash was the first stage my squad shot. My first stage is usually pretty abysmal, but I had a solid make up on the third array with decent reloads. It was also in the shade with a breeze. It may have only been eight in the morning when we were shooting this stage, but it was already humid. I finished 7th in my division in 25th place overall! Summer Reach was a limited stage with a mandatory reload after the sixth shot before the final six rounds could be fired. This was also an X count stage with each X hit removing one second from the raw time. My last shot was the only C zone hit, which was a bit of a bummer. Upon further inspection, seven (7) of the twelve (12) shots were in the X rings. This really helped shave down my time. I finished 6th in my division in 22nd place overall! Summer Fire turned out to be my best stage of the match. I find this a little funny because I was dreading the weak hand portion! Joe also gave me a bit of advice to start at the far array and work inward, rather than starting close and working out. I'm glad I listened because it stopped me from my planned draw and transitioning the revolver to my support hand. I finished 4th in my division and 16th place overall! This was my first sanctioned match and it was a great experience. Annette Aysen and her team put together a challenging combination of stages. I ended up shooting about fairly accurately with 7 Xs, 139 As, 5 Bs, and 1 C scored. The time management really impressed me as our squad shot eight stages in about five hours. Many of the local matches I attend are five to seven stages and often take about this many hours. I hope this match becomes an annual event that I can attend! I don't think my first match could have been better. Everyone was just happy to be there and helped me with all of my questions. Although my experience is limited to one match, ICORE appears to be is a fantastic sport. If you are a fan of revolvers, you owe it to yourself to shoot a match. Over the past couple of months, I've been trying to drum up enough interest in my neck of the woods to start a club. After chatting with some of the fellow shooters, I have thought of a few ideas to encourage participation at my home range. Hopefully there will be more revolvers shooters to compete with soon!